Very easy. My four year old niece helped me. It consisted of just a few ingredients. I made the soaps within an hour. I started making soaps because I was constantly buying new soaps. Not one satisfied me. I also have sensitive skin so all that change was not good for it. I thought to myself there has to be something better. And that's when it hit me why not make my own natural soaps. I am crafty, and I am very good with my hands. I'll be able to control what I put in it, nothing but goodness. None of all that extra that not handmade soaps contain. Nowadays the ingredients list are paragraphs. I like my products simple and natural. It's what is best for my skin. And who knows my skin better than me. Below I will list all the steps. Hopefully you'll have as much fun as I did. It is a very rewarding experience. 1 tbsp of oatmeal per lb. 1 tsp of sweet lemon fragrance per lb. Lay out all the materials and ingredients. Make sure you have an ample amount of workspace. Use the knife to cut soap into small pieces to be easier to melt. 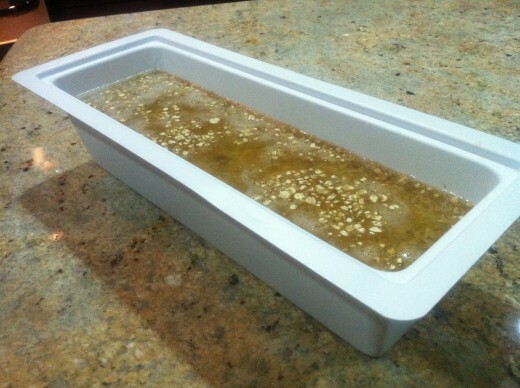 Put soap in microwave pyrex. Cover it with plastic wrap to preserve moisture from escaping the soap base. Microwave it for about 45 seconds. take it and and transfer it to mixing bowl. 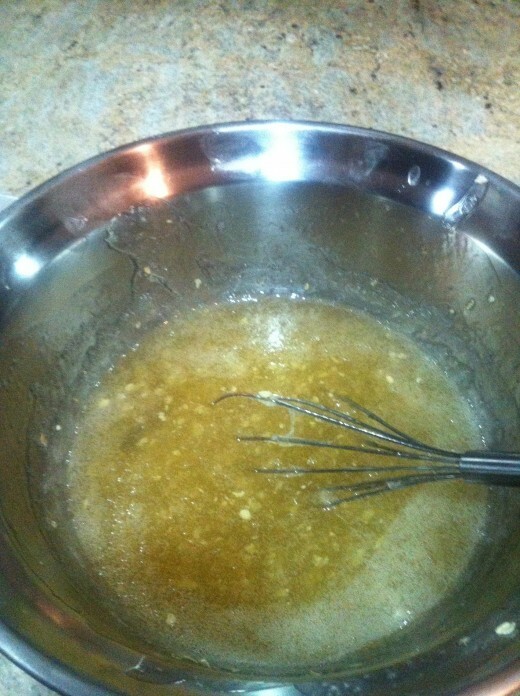 Mix in honey, oatmeal, and stir. Stir for about one minute. make sure oatmeal is well incorporated in mix. Then you're ready to pour into the mold. I put oatmeal in the bottom of the mold for a decorative touch. Also you can not fill the mold all the way and layer it with oatmeal and layer more soap mix on top. it gives it a nice look to it. 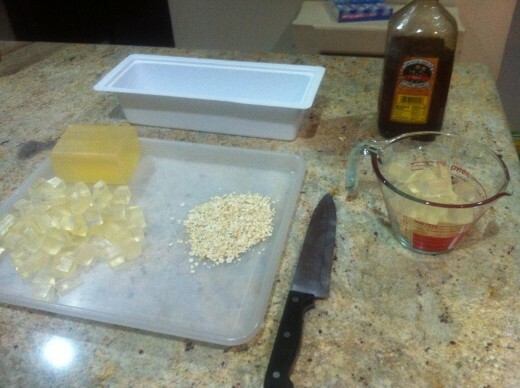 After your soap is all in the mold sprinkle some more oatmeal if you'd like. your soap will be ready within 3 hours. I like to leave it overnight. Waking up to a homemade soap is like christmas morning for me. Out of the mold. What a beauty! I sliced my soaps with a crinkle cutter. After slicing I wrapped in plastic wrap. Viola! Ready to use when you are. I hope you guys enjoy this as much as I did. You can always add your own special touches. Have fun with it. Thank you for reading Kathryn. This looks cool. 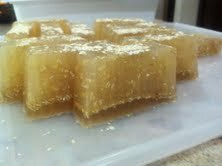 The only kind of soap I have ever made is the kind that comes in the kits, with the glycerin bars. It was interesting to experiment with it, using different molds, but I never added in any ingredients that would be beneficial to my skin. Yes of course Glenn Stok, there are organic bases you can purchase. 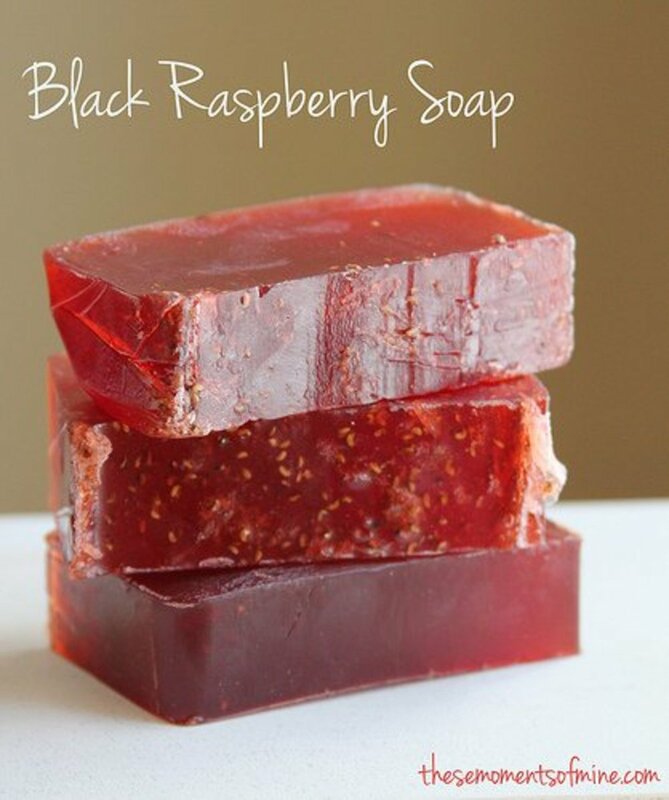 Www.Brambleberry.com has an organic soap base. 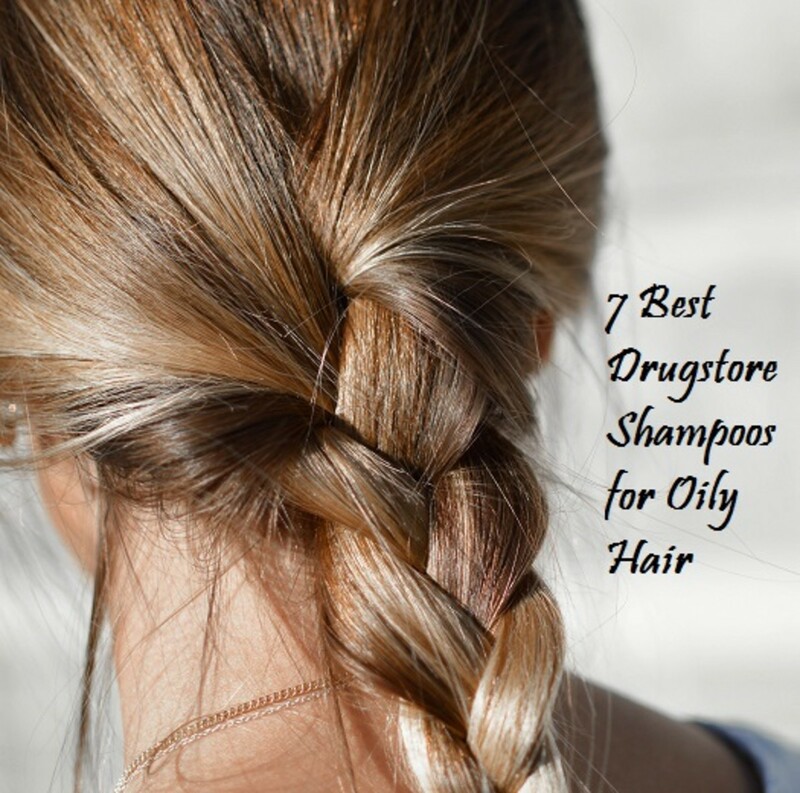 And make sure to read the ingredients when purchasing any other base that is not organic. Brambleberry lists all the ingredients for all their bases. Have fun creating your soaps. I have another hub on one of my favorite recipes I made, mint and chamomile. I will be posting more soap hubs soon. Thank you for reading, good luck on soap making. I'm glad I came across your hub. I have always been concerned about the chemicals in the soaps that I use. I might actually consider making my own soaps with the help of your hub. But as I was reading the reviews people posted in Amazon, I see that most of those soap bases have chemicals too, with strange smells. So I wonder if you can make any recommendations of a pure base which has absolutely no artificial chemicals. That's really what I would want to start with. Yoginijoy, thank you for reading. Fragrance and parabens are very dangerous. I hope you do enjoy it. The possibilities are endless with all ingredients you can play with. Have fun!! I am totally going to try this. I have been thinking about using more organic products and this way I can know for sure what is in the soap. The more I read the scarier it is. Recently I learned that any product with Fragrance or Parabens listed in the ingredients could be dangerous. So I am going to try to make this. Thanks for the recipe. It looks like fun too. Thanks!! jezebellamina. It is super easy. I thought about making soaps years ago and I just started this year. And I love it! It's never to late to start. I hope you go for it and enjoy it. This is awesome! I have been itchin' to try soapmaking for a long time. This makes it look so much easier than I thought, and your recipe is a perfect one for me to try first. 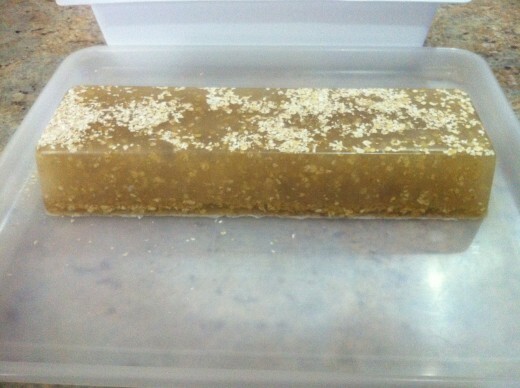 I love honey soaps. Voted up, awesome, & interesting. Thanks!! I am very happy you shared this hub. I really want to make a soap of my own. Thanks Ashley Gisell. It's perfect for sensitive skin. It's perfect for all skin types because it's so gentle. Thank you for reading Tammy swallow. You should try it, it's an easy project. I love to use honey. It is an awesome moisturizer. Hopefully the craft stores carry that soap base. Where did you get the dish? That looks perfect for creating the soap mold. Beautiful kitchen counter too! These look awesome and very unique. I have never tried this before and it looks great for sensitive skin. Thank you for reading Brett Tesol. I have sold a few soaps and gave some out as gifts. I'm currently working on my soap company, it's a work in progress, it's so much work than I thought. But it's going to get done. Good idea. Another benefit is that you could probably sell it too, as handmade and natural products are becoming increasingly popular in this high-tech age. Thanks Peggy, I'll be sure to use your suggestion and put those measurements up. Thanks for adding the exact measurements. You might want to put it up in your actual hub because as the comments grow, this might be overlooked. Am sure others will also want to know. Sounds like a project many people will be interested in pursuing. Yes great gifts and it's lots of fun too. The measurements I follow are usually 1 tablespoon of dry or liquid additive per lb of soap. And 1 teaspoon of fragrance per lb of soap. I purchased the honey soap base, fragrance and mold off of brambleberry.com Thank you for reading Peggy W and I hope you have as much fun making the soap as I did. What are your actual measurements for each ingredient and where do you go to purchase the honey soap base, the soap mold and the sweet lemon fragrance? This sounds interesting and would make great gifts! Thank you so much Angela and jazzy913. I will be putting up more recipes, I really enjoy making soaps, thank you for reading, I really do appreciate it. Sounds like an easy way to get clean while possibly eating a snack lol! I think your recipe is easy to follow and it could help people like myself who have sensitive skin. 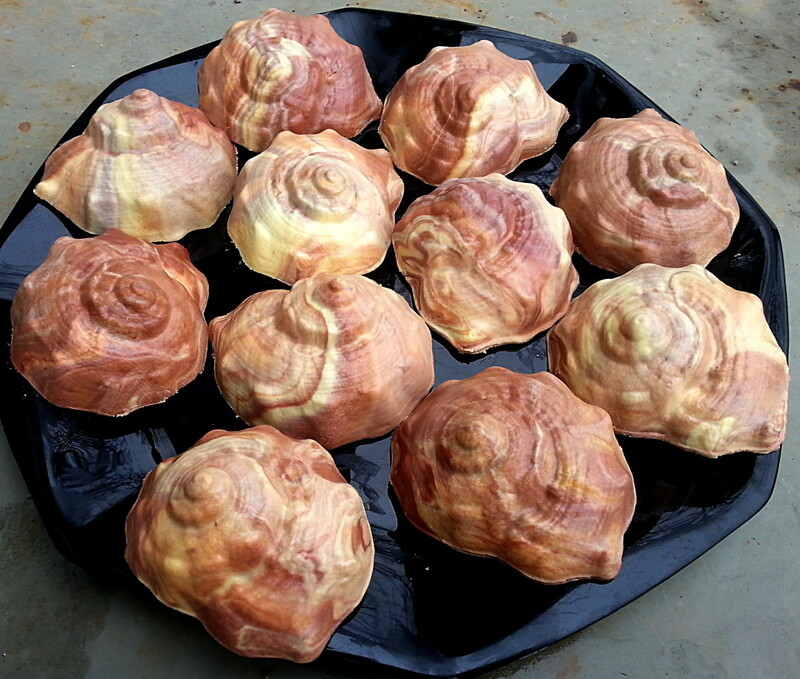 I wish you welll with it and I am sure you will create other great soap recipes. I'll be waiting! I bet this does smell amazing!!!! Great article I will share this on pin it, twitter and google+!